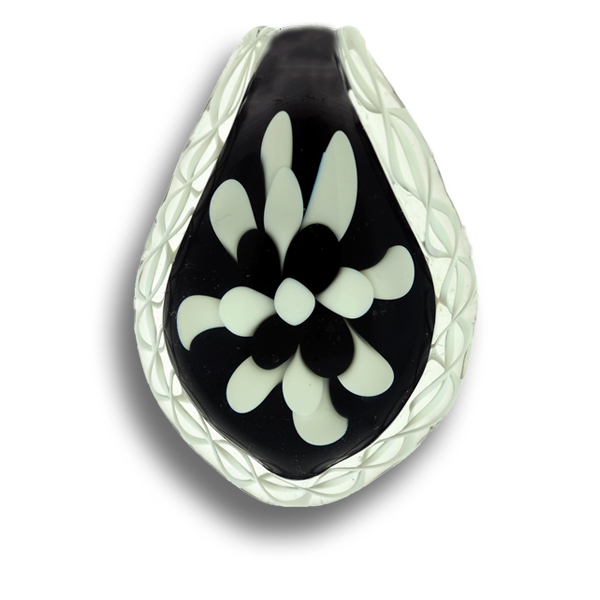 Description: This Cremation Keepsake Pendant is a classic Black & White design with a white Latticino ribbon wrap, in an optical clear Pyrex glass pendant. Cremains are embedded on the back in a clear window. Once completed, I will sign the loved one’s first name or nick name, e.g. Dad, Mom, etc. on the back of the keepsake in 22k gold, so as to be Forever in Glass. Dimensions: 1.5” x 1.25” (Custom sizes are available upon request).